In the year 1907 Moto-Rêve showed the first model at the Stanley Motorshow near Wimbledon.You could see it at the Norton stand,it was a bike with a Moto-Rêve engine 274cc called " Energette". In 1907 new Moto-Rêve Companies Ltd. were founded in Alberton and in Acton Vale. 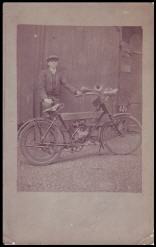 At the first time they imported complete bikes later only engines, the frames came from Alldays, Norton and Onions. English Moto-Rêve frames were differnt from the swiss frames. The top frame tube was different, the frames were longer and the pedal gearing moved more to the end. With this changed the riding position was more comfortable. Two extra footrests were mounted. Even the fueltank was different, it kept regtangular all the time. British Moto-Rêve had no beltspanner . From 1908 on the Moto-Rêve had light druidforks. In Swiss model this druidfork came in 1913.